The definition of the apostille is 'the authentication of a document for use in another country'. 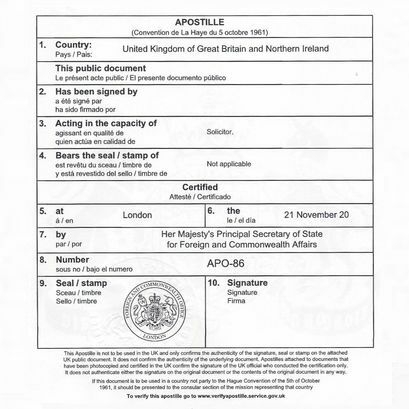 The apostille certificate confirms the signature, seal or stamp on a UK document to be genuine so that it will be accepted when presented in another country outside of the UK. The actual certificate is a piece of paper approximately 15cms square. It is permanently glued to another document and then an embossing mechanism, often called the apostille seal or apostille stamp, is used to emboss the document with a government crest. The certificate is normally added to the back of a document. However, when a document has print on both sides, it may be placed in the most suitable position, which may be on the front. The design and style of the apostille varies by country. Some members of The Hague Convention use a paper certificate like the UK, other countries use an ink stamp and some use an adhesive sticker. While the design may vary, the content should include all of the main 10 points. This is just an example apostille and not an extract from a genuine document. Your apostille should contain ten points but not all may be completed depending on who issued the document.